SOME groups from the Middle Belt declared on Thursday that they were not part of Northern Nigeria. Addressing a press conference in Kaduna on Thursday, the Youth President, Southern Kaduna Peoples Union, Mr. Nasiru Jagaba, who spoke on behalf of the Middle Belt Patriotic Front, made up of 49 associations, listed the states in the Middle Belt as Kwara, Kogi, Benue, Plateau, Nasarawa, Taraba, Niger. 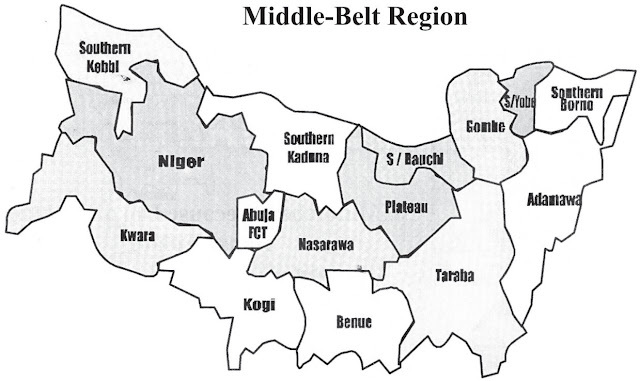 He also listed the Federal Capital Territory, southern parts of Adamawa, Kaduna, Kebbi, Bauchi, Gombe, and Yobe states as components of the Middle Belt. Jagaba said the people from the zone should be identified as ‘Middle Belters’ and not northerners. Jagaba urged the South-West, South-South and South-East geopolitical zones to partner the Middle Belt to ensure the restructuring of the country. He said, “It is no longer news that the peace, security, prosperity and unity of our beloved country, Nigeria is now badly threatened.